From the international bestselling creator of Claude comes a brand new hero: Mr Penguin. Indiana Jones meets Hercule Poirot in this new Alex T.
Smith series. Follow Mr Penguin and Colin as they crash-land on a snowy mountain. Will they be able to solve the mystery of the missing pets? What are the strange noises coming from the abandoned fortress? 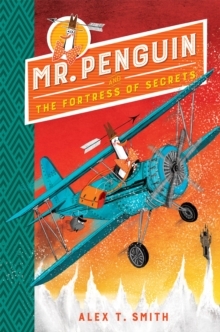 And will Mr Penguin conquer his fear of flying?Find out in the second Mr Penguin book with plenty of slapstick humour, mystery and adventure. Highly illustrated throughout with a striking black and orange design. Praise for Mr Penguin and the Lost Treasure:'Addictive slapstick' - Guardian'The perfect introduction to mystery stories.' - ScotsmanClaude won the 5-9 young fiction Sainsbury's Children's Book Award, was selected for the Waterstone's Children's Book Prize, the Richard and Judy Book Club and is now a TV star on Disney Junior.